No other country has Brazil's vibrancy. There's so much life in the landscape and that feeds through into the passionate reputation of Brazilians, who then infect the architecture, art and way of living with their energy. This is South America's largest and most varied country, with tropical rainforests, white sandy beaches, beautifully dilapidating colonial towns, mega cities with their sprawling favelas, the Amazon river and a vast wealth of wildlife. And, of course, this country’s joie de vivre and its life and variety feed through into the best places to stay in Brazil. There are many ways to experience Brazil. On many budgets. You might find yourself being whipped into a frenzy during Rio de Janeiro's Carnival, trying out the bossa nova cafés of Santa Teresa, hiking up to meet Cristo Redentor for one of the world's most spectacular views, or sunning yourself with the beautiful Brazilians on the caipirinha-soaked beaches of Ipanema and Copacobana. Or you might find yourself shopping for fashion in São Paulo, a global city of epic proportions and Brazil’s cultural capital. With 20 million inhabitants, some rich, some very poor and lots of foreigners, São Paulo has a landscape to match this cultural diversity. As well as culture and shopping, São Paulo is also known for its nightlife. If you want to come to Brazil for a beach break, try Santa Catarina. Or Bahia, with its sunshine, white sandy beaches, coconut palms and bright blue water. Salvador de Bahia was Brazil's first capital, and the ancient mix of cultures - coming from Europe, Africa and the Americas - which gathered here still shows. 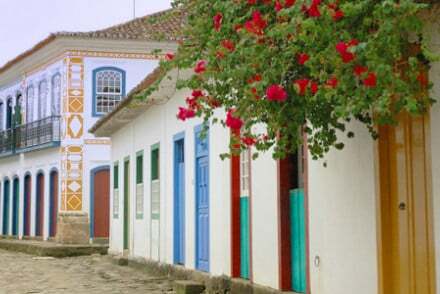 Or consider Paraty, a gem hidden just west of Rio. A colonial town surrounded by untouched beaches, jungle and natural parks. This is a great place for snorkelling, fishing and just relaxing. Or Búzios, that stunning hippy favourite east of Rio turned luxurious topical hideaway. Cristo Redentor (aka Christ the Redeemer) is one of Rio's most famous inhabitants, standing atop Corcovado, arms outstretched, looking out over the whole city. You can take the train up to the Parque Nacional da Tijuca to share his view, or you can hike, but it's a long way up. Rocky Pão de Açúcar is another of Rio's high points - this peak is best reached by cable car but you're also able to have a go at the virtually sheer rock face if you're here for an adventure. Carless, colonial Ilha de Paquetá, in the bay is a great place for an escape, as is the Jardim Botanico - filled with a beautiful display of tropical plants and trees. The Centro Cultural Banco do Brasil (CCBB), set in a glorious Art Deco building, houses a wide variety of cultural exhibits as well as three theatres, libraries and a cinema. A great place to pass a few hours. Then there’s Copacobana and Ipanema beaches. If you’re in São Paulo don’t miss the incredible markets and a stroll along the Rua Oscar Freire and Paulista Avenue on a Sunday. You also need to taste widely of what this city has to offer, it’s a fairly uncontested fact that São Paulo has some of the world’s best restaurants. You might also visit the Museum of Modern and Contemporary Art and the Museum Arfo Brasil in the beautiful Ibirapuera Park. The Pinacoteca do Estado de Sao Paulo is the city's oldest art museum housing a wide variety of visual arts exhibitions and specialising in works from Brazil's most famous artists. Salvador da Bahia is Brazil's most African influenced city - you taste it in the food, see it in the traditions and hear it in the music. The city is often in festive spirit, with music and parties celebrating one thing or another spreading out onto the colonial streets which has wonderful 17th and 18th Century architecture. Porto Seguro in Bahia is where the Portuguese first landed and it is the colourful history of this town, along with its reputation for fun, that draws many visitors here. The small historic centre is where you'll find all the old colonial houses. You should also get out of the cities and into the lush interior. The Chapada Diamantina National Park, 375,000 acres of tropical forest covering mountains and concealing waterfalls, natural swimming pools and caves. There's even a waterfall so high (380m) that the water never actually hits the ground - it vaporises in the wind. You can camp in the park but there are also plenty of more luxurious accommodation options. And then of course there’s the state of Amazonas, which has the Amazon Rainforest, Anavilhanas and to the Jaú National Park. Brazil also has the Iguaçu Falls and the world’s largest wetlands, the Pantanal. And onto the fantastic coast! In the right seasons important whale watching and sea turtle preservation goes on - these can be truly astonishing natural events. Jericoacoara is hard to get to, you have to traverse unpaved roads through sand dunes, but it is so worth it when you arrive. It’s stunning. This level of beach + lagoon + sand dunes beauty is usually reserved for tropical islands, but this definitely classes as paradise. Plus there are excellent pousadas and restaurants and proper South American nightlife. Right on Ipanema Beach, Fasano is a Philippe Starck-designed retro-chic paradise with fifties and sixties furniture and spacious airy bedrooms - many with two double beds placed to maximise ocean views. Staff even wear vintage uniforms! There's a rooftop pool and bar to retreat to when you've had enough of the beach. Featured in songs, films and books, the Copacabana Palace is an iconic place to stay in Rio. There's all-out marble and chandelier bedecked grandeur in public areas, so the feeling is traditionally luxurious. The beachfront rooms are the best with their terraces. The pool, bar and restaurants are quite something. The Ipanema Penthouse is a three bedroom apartment with chic, all white bedrooms with private balconies, a rooftop pool and fantastic panoramic views of the city. 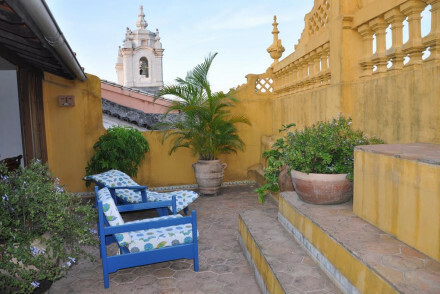 Casa do Amarelindo is great for a city break in Bahia. In the bustling heart of the pretty Pelourinho district, it offers a quiet spot, a roof terrace, fantastic views. Just ten rooms, with no guests under 14 accepted, this is a grown up, intimate hotel. Emiliano is an extremely cool luxury hotel, chic designer suites with private butlers, complimentary massages and some have private pools. Gourmet Italian restaurant, beautiful spa, helipad for those who fly straight in! The Tivoli Sao Paulo - Mofarrej is a luxury boutique hotel to the hilt! Minimalist with all the mod. cons., and bags of individuality. There's a fabulous French restaurant, a Banyan Tree Spa and a roof top terrace with pool. It's surprisingly family friendly as well. The Hotel Unique is a five star designer boutique hotel in the shape of a ship. Suites are decorated in minimal muted tones and plenty of style, there's a wonderful roof top terrace, a pool with views and a gourmet fusion restaurant. Rio Atlantica is a large hotel on the beach at Copacabana. Rooms and suites are modern and luxurious and some of them also have spectacular views. 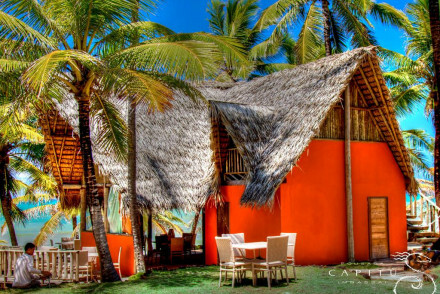 Just down from São Paulo, Vida Sol E Mar is a beautiful, eco-friendly beach resort. The location is idyllic and the resort makes the most of the view with as many floor to ceiling windows as possible. The Ponta dos Ganchos is also just below São Paulo another dreamy beach paradise, this time with enormous luxury cabanas with private pools, balconies and hot tubs. 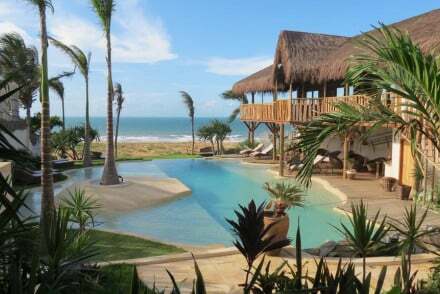 Uxua Casa Hotel in Trancoso is perfect if you're planning a luxurious beach break. Its ten 'cases', or wooded villa huts, are surrounded by a luscious, shady garden and you're just a short stroll from the beach. Txai Resort ion the Coconut Coast is best for the eco-conscious. Slightly undeveloped and colourful with just the right blend of rustic and comfort, these 40 rooms and bungalows are perfect for a tropical escape. You're right on the beach, but with access to plenty of resort style facilities. Insolito, tucked away on the side of the Búzios peninsula, is a sleek, minimalist hotel with an excellent fusion restaurant and amazing sea views. 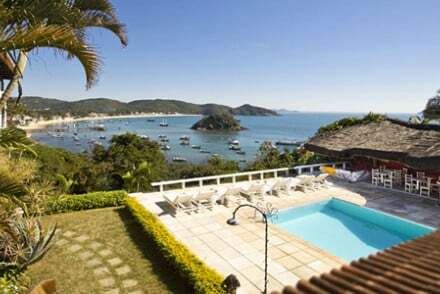 The Cachoiera Inn is two hours from the capital, in the buzzing resort of Búzios, the St Tropez of Brazil. Cachoeira means waterfall in Portuguese and there are nine here as well as pools and a swim-up bar. There's a multilevel reef just off the coast, so this is a great place for divers and snorkelers - this is a great spot for meeting local turtles. Can you resist lying in a hammock under a palm tree sipping a caipirinha? Absolutely not. Pousada Picinguaba is by a secluded bay with a white sandy beach. Its chic, all white rooms have wooden floors and four poster beds. Great for meeting the local wildlife, also great for romance. 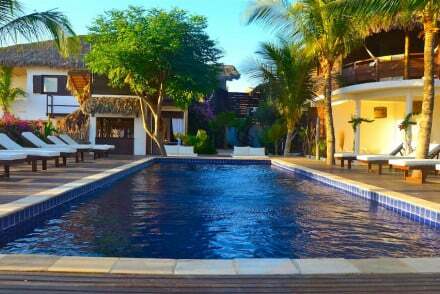 Fazenda da Lagoa is a secluded eco-retreat on the Coconut Coast with just fourteen cabanas. Here you'll find peace and quiet amongst the coconut groves, personalised spa treatments and a total pampering service. Casa Cairucu in Paraty is a a gorgeous eco lodge with views over crystal blue water. 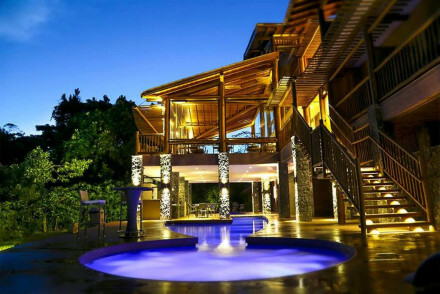 A smart wooden structure on stilts with just four rooms and floor to ceiling glass windows. This is the perfect spot for families or groups of friends who want the outdoors in all its greatness. Also in Paraty, though this time in the town itself, Casa Turquesa is a charming colonial house with three romantic bedrooms filled with artefacts and paintings. Fazenda Catucaba is a glorious farmhouse set in a luscious green valley with chic boutique rooms and suites, log fires and fresh local produce prepared by fantastic chefs. Fazenda São Francisco do Corumbau is best for whale watching. On a private stretch of quiet beach, there are excellent amenities for scuba diving, snorkelling, fishing and other water sports. There are just ten private bungalows scattered amongst the palm trees and it's all very family friendly. The Etnia Pousada and Boutique in Trancoso has eight rustic, individually styled bungalows just a few minutes walk from the beach. The Cachoeira Inn, a favourite of Brigitte Bardot, is a slightly quirky hotel set in a tropical forest. Its wooden structure on stilts fuses Asian and Brazilian architecture and you'll find art from all over the world, nine waterfalls and two private beaches. The Santa Teresa Hotel is hipness HQ in Rio's Santa Teresa serving up luxury boho chic. The loft suite is the ultimate, but the verandah rooms are also excellent. The restaurant serves acclaimed Brazilian-French gastronomy by French chef Damien Montecer. São Paulo's Hotel Unique is a boutique designer-chic hotel designed in the shape of a ship. The rooftop terrace, extensive spa and gourmet fusion restaurants are hip places to be seen. 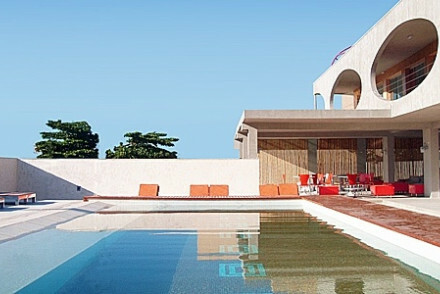 Luxurious and modern, the Fasano Hotel is another competitor for São Paulo's hippest hotel. As well as a rooftop health club, a top of the range spa and multiple restaurants, the Fasano also has a jazz club. Emiliano might just possibly be cooler though? Luxury all the way - including private butlers and complimentary massages, this hotel is so cool it doesn't even need to try too hard. Understated to the point of being a work of art. Close to one of Salvador's best beaches, Hotel Cocoon & Lounge is a funky, spaceship-like hotel building - it's very 60s, in a futuristic, cool way. 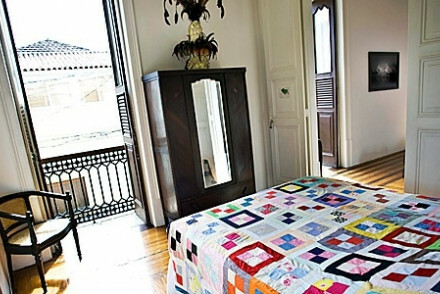 Castelinho38 is a cheerful hotel in Rio's bohemian quarter, Santa Teresa. Rooms are large and colourful - some with sea views and there's a lovely breakfast terrace and garden. The seven rooms start from £67 per night. This is also one of the best places in Rio for families. Quinta Azul is a good value boutique pousada in the quiet hills of Santa Terese. The house itself is over 120 years old with thirteen comfortable rooms, close to restaurants and galleries and just ten minutes from the beach. Room rates start from £87 per night. Ilha de Toque Toque in São Sebastião is a collection of contemporary chic suites with beautiful bay views. Enjoy the view from a hammock on your private deck All starting from just £69 per night. Abracadabra offers perfect sea views over the bay of Búzios, with rustic chic rooms, a lovely pool and a fantastic seafood restaurant. Most visitors arrive at Rio de Janeiro-Galeão International Airport, which is just north of the city centre. British Airways fly direct from Heathrow and it takes about eleven and a half hours. Flights between London and São Paulo are a similar length and arrive at Sao Paulo - Guarulhos International Airport. If you’re travelling from elsewhere in Europe you might go via Lisbon, then you’ll have access to Brasilia International Airport, Natal Airport and Salvador International Airport as well. Flying via the US you can also connect with Recife and Salvador. Brazil is dry between March and November and wet between December and February. Though in the rainforest interior it’s warm and humid year round. A cheerful hotel in Rio's Bohemian Quarter, Santa Teresa. Large colourful rooms, suites, and triples, with sea views. Lovely breakfast terrace and garden. Excellent value, idea for families on a budget. Sights nearby - Santa Theresa is Rio's bohemian quarter, Carioca Aqueduct, Museu da Chácara do Céu. 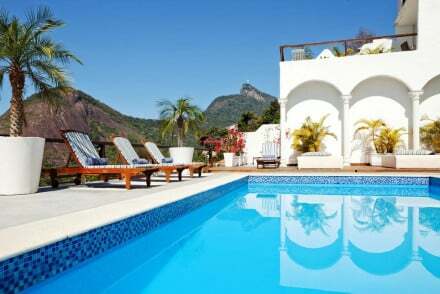 Excellent hotel in the hill-towns of Rio, overlooking the city and the Atlantic. The hotel's highlights include stylish rooms, a rooftop pool and stunning views of the Corcovado Christ Statue, Sugar Loaf Mountain and Guanabara Bay. Superb value for money. Local exploring - Just a short way from the centre of Rio, it's perfect for exploring the historic city. Value chic - Stylish accommodation at a very reasonable price. Surfing - The beaches surrounding Rio are hotspots for surfing. Sights nearby - Less than two miles from Christ the Redeemer. A contemporary chic collection of suites above the bay of São Sebastião. Stunning views, hammocks on private decks, lots of natural light and all the mod cons. Excellent seafood restaurant and verandah, gym, pool, and private hot tubs in some rooms. Ideal for total relaxation and beach life. Beach Life - The beach is 50m below and the perfect place to chill out. 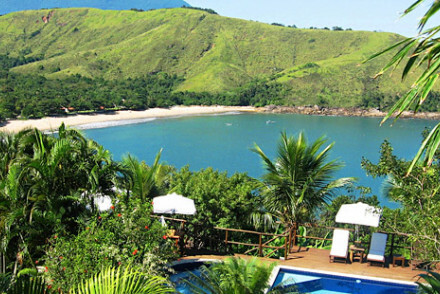 A charming hotel hidden away on the lush, mountainous island of Ilhabela. Wooden-built with an eco-friendly focus, the hotel features delightful rooms with balconies facing out over the mountains. Take a hike up Baepi Hill or recline by the pool. Birdwatching - Ilhabela is a great place for birdwatching. Great walks - Superb walking routes around Baepi Hill. Local markets - Browse the local markets of Ilhabela. An adorable boutique guesthouse in historic Paraty. Just three suites have white washed walls and private patios. Fantastic breakfasts and access to all the beaches, waterfalls, and rainforest activities around. Ideal for families, excellent value, lots to do. Sailing - Dona Geralda schooner. Sights nearby - Forte Defensor.